JNW ENGINE & MACHINE is State of the art. Why the Technology is the best in the market? Why the SERDI Technology is the best in the market? The dual air-float automatic centering system was the first in the world made with the patented process developed by the SERDI Company. This unique method uses a solid carbide straight shank pilot. When inserted into the valve guide, it simulates the real valve stem during the centering process. This guaranteed the valve seat is finished within the closest tolerance for a perfect valve to seat match. The new design SERDI workhead greatly reduces the number of parts free-floating during the centering sequence. The built-in spindle motor eliminates all pulleys, belts and transmission shafts. This results in minimal workhead inertia and maximum floatation for unmatched sensitivity and accuracy during the centering process. From Import & Domestic Engines, to High Performance Racing Engines, to Motorcycle Engines, to Marine Engines, to Trucks Public Transport Engines, to Locomotive Engines, to Small Engines, to Stationary Engines, SERDI is the one! SERDI is the Worldwide Leader. Over the years, our goal has been to expand and improve the technology that has made our customers successful. 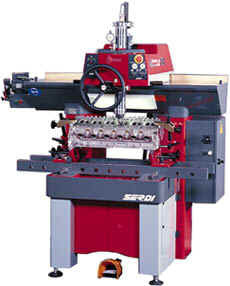 SERDI has grown to become a leading supplier of state of the art automotive machine tools. SERDI products can be found in shops in more than seventy-five countries around the world such as Honda, Kawasaki , Suzuki, General Motors, Ford, Chrysler, Cosworth, Ferrari, Lamborghini, Cagiva, Ducati, Volkswagen and more… . With literally thousands of users, in every category from major OEMs … to Production Rebuilders … to every segment of High Performance … to one and two man shops; SERDI remains at a level of technological expertise second to none in our industry. LS6 GM Exhaust seat was cut with JNW Engines own custom radial profile . we have profiles for all factory angles and custom flow bench proven cutters. New for 2010 Rottler milling machine will produce a mirror finish for the MLS gaskets . Vacum testing exhaust seating. Built right in the Serdi system.